Less financially secure Americans lean toward the Democratic Party, but are also less likely to vote, especially in midterm elections, according to a new report from the Pew Research Center. The survey released Thursday by the nonpartisan Washington-based research group looked beyond income to measure economic security, instead considering such factors as whether people are employed, have difficulty paying bills or possess a retirement savings account. Those who Pew ranked as the most “financially secure” were almost certain to be registered to vote, with Pew classifying 63 percent as likely to vote in November. But among the bottom 20 percent, only 54 percent are registered and only 20 percent were likely voters in the midterms. The survey was conducted in September and October, before the election in which Republicans took full control of Congress. The survey found the GOP enjoys slightly more support among the most financially secure ? 49 percent in that group favored the GOP candidate in their U.S. House race compared to 42 percent for the Democratic candidate. But support for Republicans shrinks the further down people fall on Pew’s financial security scale, with the GOP candidate for House preferred by only 17 percent of the least financially secure. Support for Democrats, meanwhile, was constant across all levels of financial security. But nearly as many of the least secure group was unsure of whom they would support, or backed a third-party candidate, as those who supported the Democratic candidate. The survey concludes the apathy of those who are least economically secure hurt Democrats in November. “As a consequence, in 2014, the Democratic Party left far more potential votes ‘on the table’ than did the Republicans,” it says. The survey found the financially insecure are disproportionately minority and female, and particularly unmarried women, one of the core constituencies of the Democratic Party. The least financially secure are also the least politically knowledgeable, Pew found, with only a quarter knowing which party controlled both chambers of Congress ? the equivalent of a guess, since there are only four possible permutations. Meanwhile, 61 percent of the most secure could answer that question correctly and they were far more likely to have contacted a politician than the insecure. The insecure are more supportive of public spending to help the needy than the secure, and more skeptical of business. On social issues the insecure and secure have similar views, with one stark exception. A higher proportion of the insecure ? 44 percent ? believe immigration is a burden on America. Pew’s data was drawn from interviews with 3,154 people conducted online and through the mail via a panel of respondents originally contacted using a probability-based phone survey. 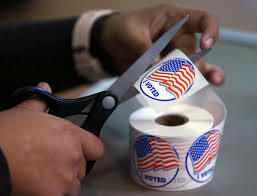 Because final statistics on who cast ballots in the 2014 midterm elections are not yet available, the report calculated the likelihood of each person voting, but it noted its results track data available from the last midterm election in 2010, when Republicans also dominated and the financially insecure generally stayed home.